I’ve written before, at no doubt tedious length, about my difficulties with the fortepiano, and this same pair’s Beethoven recital left me slightly less than impressed. 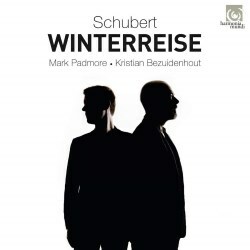 I might not be entirely won over by this new Winterreise disc, but it certainly left me questioning my prejudices. Even if I didn’t love every sound that they made, the disc definitely left me with a greater admiration of both men’s mastery as artists. Let’s start with Bezuidenhout’s tricksy fortepiano, a Graf from the Edwin Beunk collection. The metallic clang of the instrument remains a problem for me, and if pressed I’d definitely still prefer the expressivity of a modern concert grand; but I have to admit that the recessed sound of the keyboard (and I’m certain it’s the instrument rather than the recording balance) added to the music’s sense of isolation and apartness, underlining the poet’s sense of loneliness like few other recordings I’ve heard. The steady trot of Gute Nacht, for example, sounds a bit more manageable, but perhaps even more tragic for that, and the frenzied swirl of Erstarrung sounds all the more powerful after the understated poignancy of the tears of Gefror'ne Tränen. The rustle of the Linden Tree is colder than I’m used to and, therefore, I didn’t find Der Lindenbaum as moving as usual, but the frozen tinge of Wasserflut is more effective than normal, and the angry semiquavers of Rückblick sound even more dissonant. What’s more, Bezuidenhout throws in lots of little, subtle touches that show how deeply he has engaged with this music. He arpeggiates the off-colour chords at the beginning of Gute Nacht, for example, in a way that seems to underline the tragedy of the poet’s mission, and he is undeniably clued into the words every bit as much as the singer. On that note, Mark Padmore is on better form than I’ve heard him for a while. He lingers lovingly on individual words (“Fremd” in Gute Nacht, for example) in a way that seems to cling onto them, and he is a master of the differing moods of the songs. The wounded sorrow of the opening of Gute Nacht turns into unreciprocated concern when it sweetens into the major key in the final verse, but this is then cast aside into anger at the opening of Die Wetterfahne. He then sounds unbearably wounded in Erstarrung, before the pain of his lost hope in Der Lindenbaum, and there is a hollow, almost ghostly tinge to his voice in Wasserflut. He is most impressive in summoning the growing tide of wounded rage in Auf dem Flusse, and there is a terrible bleakness to Einsamkeit that reminds you that Schubert had originally stopped writing the cycle at this point. What a full stop that would have been! In fact, it’s in the second half of the cycle that the pair reach their greatest heights. Die Post strikes an incongruous note of jollity, while Padmore summons up an affecting paleness to the voice in Der Greise Kopf, and I enjoyed the fortepiano’s metronomic circling during Die Krähe, repetitive but flexible enough to avoid sounding repetitious. The leaves of Letzte Hoffnung fall to the ground with a weirdness that almost suggests Ligeti, while there is warmth to the undulations of Im Dorfe that I hadn't expected from a fortepiano. The foul weather of Der stürmische Morgen works very well, though, as does the deceptive, folksy warmth of Täuschung. A real sense of loss settles in with Der Wegweiser, however, hugely poignant (if a little rushed) where the minor key gives way to the major, and Padmore sings both Das Wirtshaus and Die Nebensonnen as though they were recounting out-of-body experiences, so intense is the introspective grief they provoke. The bravery of Mut! is entirely unconvincing (intentionally, of course), and the fortepiano makes the hurdygurdy of the final song sound even more distant and ghostly than usual. This even affects Padmore’s voice, which sounds hollow and empty, leaving a ghastly question mark hanging over the end of the cycle. I’m not convinced that his voice is in as good general shape as it was, and that’s one of the several reasons why I prefer his earlier cycle with Paul Lewis on Harmonia Mundi, not to mention the role played by Lewis’ own peerless expressivity with the piano line. However, I confess I enjoyed this disc more than I suspected I would, and a big part of that is Bezuidenhout’s way with his instrument. If you want to hear the cycle sound more chilly and isolated than usual then this might be a recording for you. Just make sure you wrap up warm before you listen.